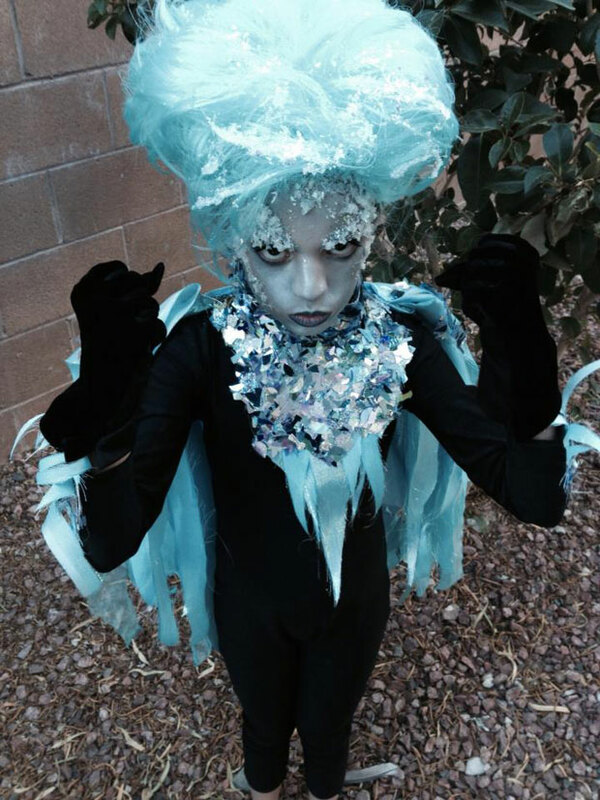 Check out this awesome young lady cosplaying the New 52 incarnation of Killer Frost! How cool is that (pun intended)?!?!? Click the image below to enlarge! The image above was posted to Reddit shortly after Halloween. I reached out to the girl’s family and her mother was kind enough to write back, providing some history on the costume and more photos! Below is the note from the cosplayer’s mom, followed by more pics! My daughter is nine years old and comes from a long line of comics enthusiasts. Every year I encourage her to choose a character she’s interested in learning more about to cosplay and I try to put together a costume that will make it especially fun for her. She’s done Princess Leia, Wonder Woman, Poison Ivy, Neytiri, Marie Antoinette and Nefertiti. 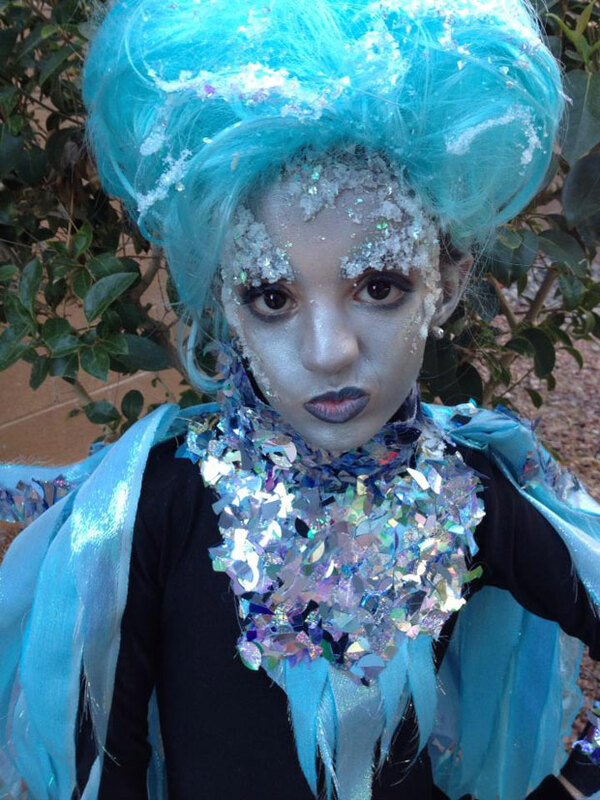 She’s always been partial to DC characters and over the summer she was excited to attend some local conventions here in Las Vegas to get some ideas. We are fortunate to have a very good friend in Ralph Mathieu who owns our favorite comic book store, Alternate Reality Comics, helps us get our hands on the source material for all her most beloved characters. We bought the Injustice: Gods Among Us game when it came out and she played it for months. I played Killer Frost and she played Raven (her all-time favorite character) in some pretty epic duels. Since she had just cosplayed Raven at a con in June I suggested she consider another character. And so began her interest in Killer Frost. The Killer Frost costumes in Injustice are too mature for a nine year old so we sat at the computer and did an image search and spent some time researching the many incarnations of Killer Frost until my daughter decided which she liked best. It just happened to be Caitlin Snow from JLA 7.2/Forever Evil storyline. My daughter and I love spy stuff and science so this version seemed like the perfect fit. 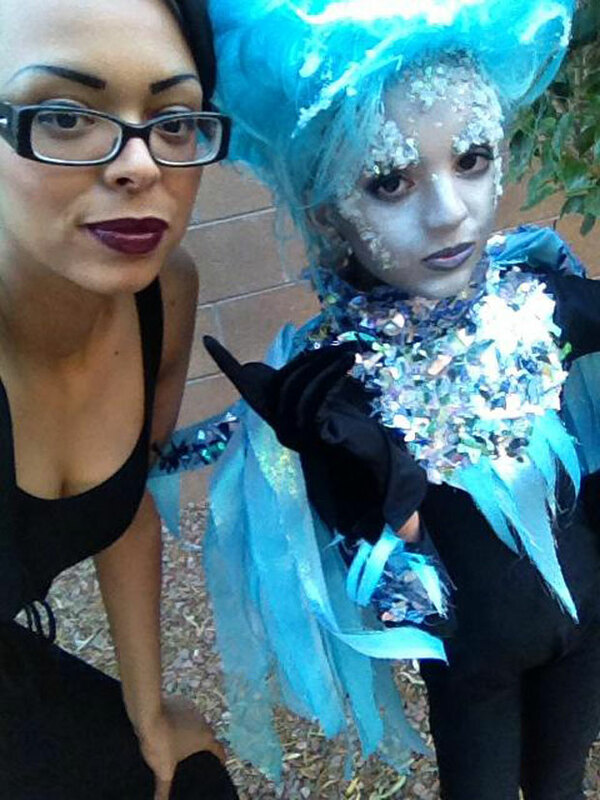 She and I got to work conceptualizing a costume and spent a week making it. This is one of our favorite ways to bond! And if you have seen any of the other pictures from Halloween, you can tell this kid gets WAY into cosplaying. Those pictures are adorable! She is so cute, yet intensely into the role! Love it! 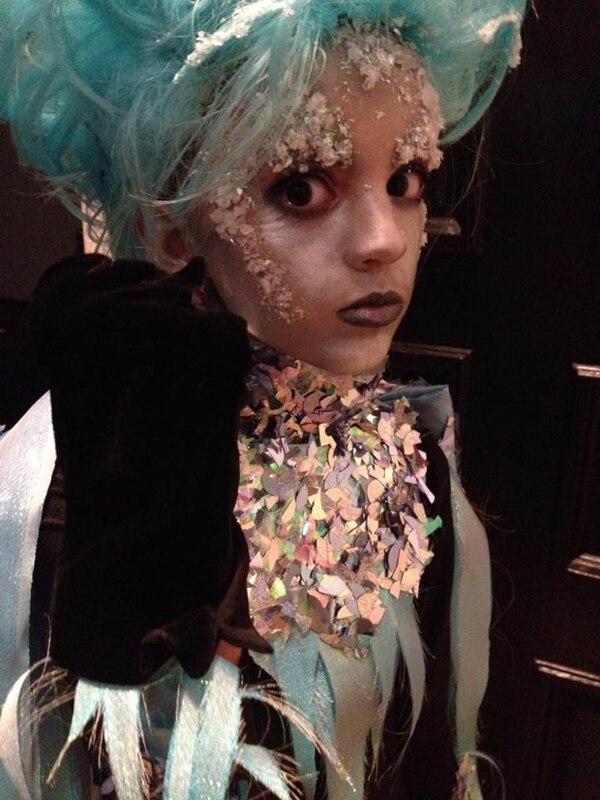 I’ve got a 7 year old daughter myself, so I can totally understand a young lady’s passion for dressing up and character-play. And what a great project for mother and daughter to work on together! Absolute Win-Win!! My thanks to Allen Lee Hansard, boss-man over at the Superhero Costuming Forum, for the heads-up on this super-fun cosplay! Support Firestorm (and Killer Frost cosplayers)! Fan the flame! 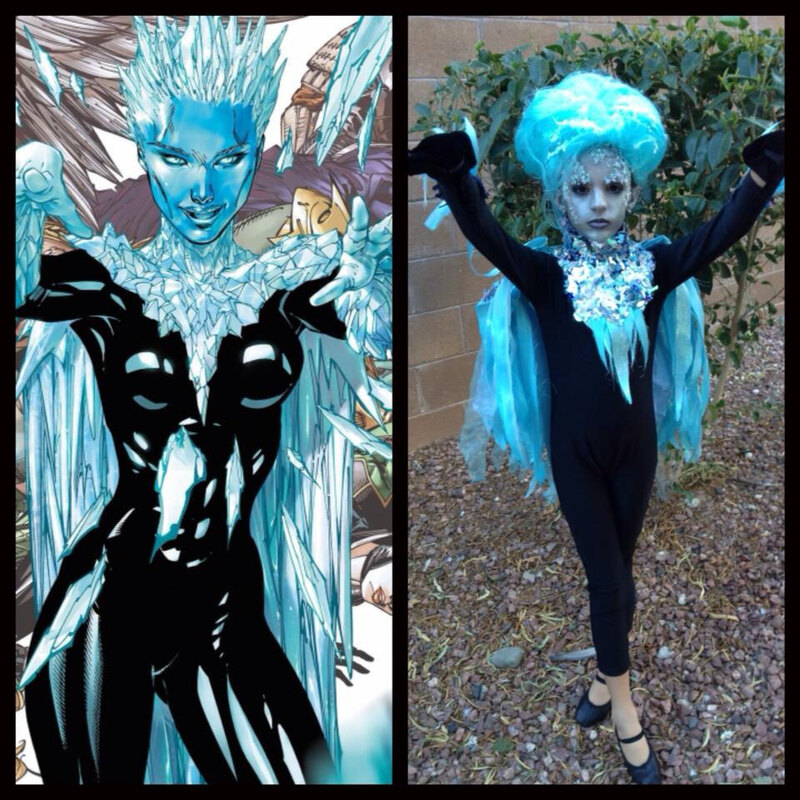 Posted in: Cosplay, Killer Frost. That is FANTASTIC!!!!!! So cool! We’re glad you like it. Thank you for bringing Cailtin Snow as Killer Frost to life! You’ve got some forever fans in us. The intensity on that girl’s face kind of freaks me out. In a good way, sure, because it’s awesome that mother and child have bonded over something like this. Still, though, that girl terrifies me! Drunky, I was thinking exactly the same thing. I’m about to do a cosplay on killer frost and this is the most interesting thing I saw on the internet. I’m just wondering what materials did you use for the those glittery thing on the face, and the cape.